And we continue today with the curio cabinet - home to most of my hexie UFOs. This is my hexie puzzle project. The only fabric I purchased was the cream for the background. Everything else is scraps. Some were mine and some were from friends. Some were fussy cut and some were not. Unfortunately I am at a serious standstill on this project. 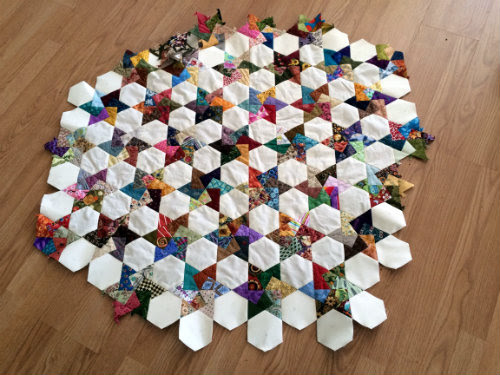 I had intended to make a circular quilt to put over the top of my great aunts small pedestal table so that the pretty feet would still show. I was having trouble getting a round shape so I was going to make it into an oval. You can see 2 opposite corners (top right/bottom left) are not the full star and that was where I had started to round it off. I became thoroughly frustrated and set it aside for something easier and here is still sits, waiting for inspiration. Ughghgh. Hard to tell from the photo but this is probably arm's width wide. I just needs a new purpose so I can continue working on it. 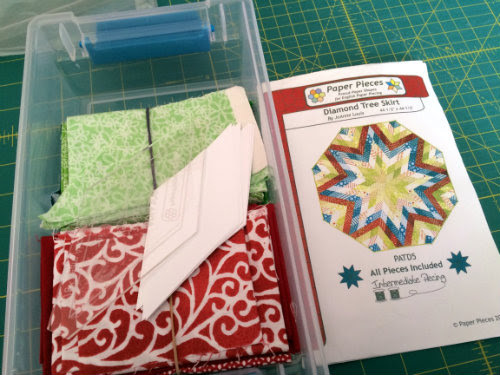 This next box is a someday project using the Ferris Wheel pattern, shown below. I've spent so much time trying to arrange the chosen fabrics to fit the 3 shapes in this pattern that I've been thinking for the past 3 days that maybe the fabrics should just be put back into general circulation and some day the "right" fabrics will pop up in front of me and then I can start the project. I think when I get home tonight I'll be emptying this box and finding something else to put in it!! I think this selection started with the 2 feathery FQs at the top right. I LIKE the fabrics, I just can't make them fit in to the 3 shapes of this pattern. 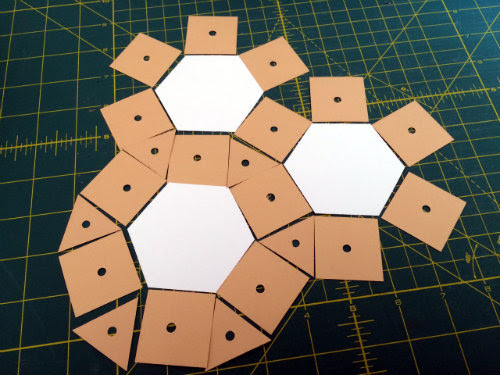 This is called Ferris Wheel - it's just 1.5" hexies, squares and equilateral triangles. I've seen lots of fabric placement ideas online but none of them really grab me. Some day, I'll find the 'one' and get this project started. This kit was purchased with several Christmas gift certificates an unspecified number of years ago. When it grows up it will be a tree skirt. 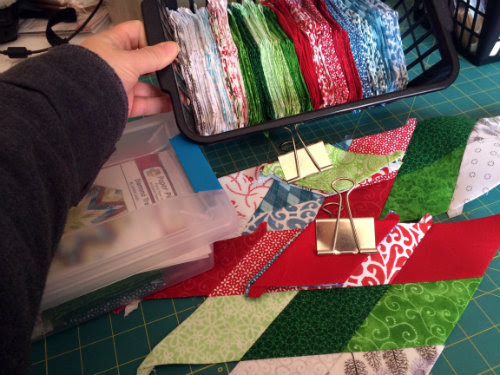 I mean every hexie-ologist should have at least one hexie tree skirt, right??!! This is the left over fabric and papers after basting all the diamonds. and the pieces that are already stitched together. This pattern needs to have some thought put into placement so the fabric usage is balanced. I'm finding that I don't work on it at home so I'll have to come up with another plan. 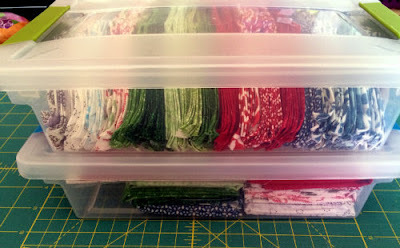 one box, making room for 2 projects. And lastly for today is this table runner that is going to be made out of Cherrywood hand dyes. 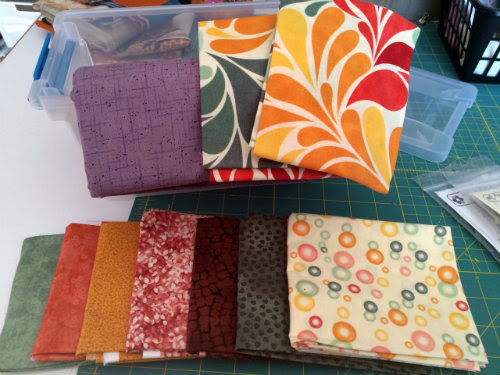 I'm flinching cuz I bought this FQ bundle in Houston in 2011. The fabrics are so soft, I just want to pet them instead of stitch them. 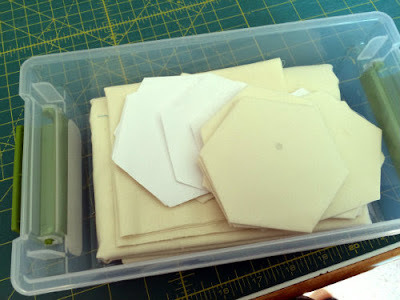 Check this link for the rainbow runner that I am going to formulate with these hexies. This is the most facinating curio cabinet - is there more? Wow, Sarah, I had NO idea the scope of your hidden hexie projects. I don't know if I should be apologizing for putting you through this, but I feel a strange fascination to see what comes forth next! BTW, those Cherrywood fabrics have such depth--gorgeous!! Go forth and organize. You do have some very pretty projects. You are doing a great job of organizing the curio. Lovely projects. I love the Ferris wheel block. I have always wanted to make this quilt.